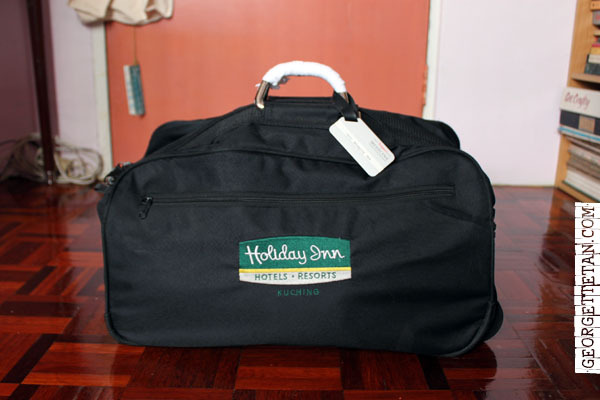 One of the best press freebies I’ve ever gotten is this trolley bag from Holiday Inn and Crown Plaza hotels, back when the hotels still had a franchise here. The bag has a decent capacity and I’ve taken it with me to Thailand, Bali, Singapore and all parts of Malaysia. The only thing I don’t like is the tiny slippery handles, which I wrapped with cloth tape for better grip. I’ve recently gotten a North Face backpack (the Vietnam street variety which started falling apart almost immediately) for trips where I can’t afford to drag a trolley bag behind me. It’s somewhat comforting to revert back to this bag. I’m jetting out of here again, this time for a work trip. While I’m not going very far, it does require the use of my passport. And who knows, maybe I’ll have time to post with images from my next port.